Damm! Fixing bugs until 7:30 is pain when you want to catch your train at 10:00. Finally got a lift from Santy to reach home on time and sent the last mail for the day. I had only minutes to start of for the travel. So I just threw all the things that are to be packed that I *remembered* and stuffed them into a bag. (Now, I realize that I had drew a blank more than what I remembered. :)). Then the phone rings and my friend at the other end saying he was not able to make it to the travel due to his work (everybody seems to take the same road when it comes to work...). So I need to travel alone then :(. Ah I still haven't got back my MP3 player from my friend which I though I can use to fill my loneliness in travel. Or a book!? But then fore casted that it would be less time to read a few pages in my speed before I go to sleep. I don want to talk about those unmerciful autowala who take every opportunity to make a hole in your wallet. By the time I reached station, I was happy to see the Global warming getting some attention. There was a live CO2 and N2O reading meter at the entrance. I even tripped on a lady's suitcase on watching it. Directly went to the large screen to scan for the train number 1013. 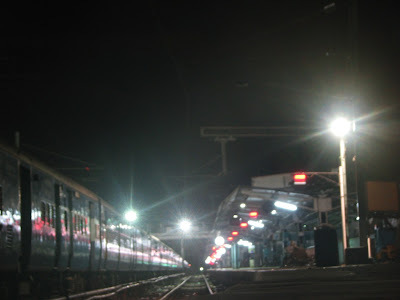 Finally there it was Kurla express at 22:05 in Pt #3. Had a little snack and took my seat in a passengers waiting bench. Kanyakumari express set out on time. After a brief dinner was waiting for my train and there came "Chennai mail" on the platform. Err! that was a surprise. Then came a voice in the announcement speaker "Passengers, your kind attention please! Train Number 1013, Kurla Express, From Kurla, via Bangalore to Coimbatore is expected to arrive at 23 hours 55 minutes". Yes my heart skipped a beat and I concentrated to listen in other languages too, they all meant the same. The train was two hours late. What can I do until then? With the last bit of battery that remained in my mobile I call my home and friends to say that I will be late. Well I decided to take a walk in the station until then. The walk was beguiling. I saw a diversified on the station. The first group I saw was a gang of three who were sitting inside a immobile train talking about their old days. On hearing the news they started thinking of how to spend the time until then. Finally they decided to go to the nearest bar :). A maintenance worker of the station came and started to switch off the lights in that train and started to close the doors. I needed to get down and start walking again. Few of them were on the phone making their own chit-chat. Some were having their earphone plugged and some even put the music on the loud speaker. Many decided to catch some Z's until the train comes, they caught hold of news papers, carton boxes and bedspread, put them on the floor. A girl with tear filled eyes talking to a nun. Two full walks over across the entire stretch of the platform. When my bottom of my foot started to ache. I decided to take some rest right below the steel staircase where some workers lockers are kept. As my clock clicked two drunkard came to that place, I sat ignoring them. One was not able to stand soon lied down on one of the metal case to opposite to me. Then other decided to smoke by moving away from light to hide himself. Few minutes passed and both the men took off since some policemen was passing that place. Then again I saw alone with some company in the ground. Rats! :) Yes they were of all sizes and running all over in search of food. In my observation they use both their sight and smell to live those conditions. Now and then they come out and sniff the air for any food and their eyes in constant watch out of any danger. With the slightest movement they sped into the dark. Then came a old women who with a stick who was unable to walk. I noticed her some time back in the walk who was asking for some penny to people. She was very weak and her look mean so lost. Soon she started the conversation with me asking is the train late? (in kannada) I nodded my head in positive sense. Then she asked when is it coming? I never knew the translation of 12. But managed to tell the same in Tamil and she interpreted that it was 00:00 and responded back the same in kannada. She then asked did you have you dinner(utta)? I said yes. She took out a half pack of Goodday biscuit that someone donated and asked me to have one. I was full with my cup noodles and politely denied it. With the sound/smell of the biscuit packet in her hand the rats below got excited and started to run across more frequently. Taking all the risk to come as much near her feet to sniff for some food. Then one of drunken men returned to the place, the old women asked him too if he had taken his dinner. The guy replied negative. Then she took out a small bag that had some food and gave it to him. Since he was using his seventh sense din know what to do with that pack and let there and went. Out of that half pack she donated a half piece to the rats and a full piece of biscuit to the dog that came across. I realised that not every one who demand money are bad. She was one kind good women. Then she said bye telling that she cannot sleep here since those drunkards would come back. Finally time was fast approaching Midnight. Again the same voice that came out, "Passengers, your kind attention please! Train Number 1013, Kurla Express, From Kurla, via Bangalore to Coimbatore is expected to arrive at 01 hours 30 minutes". Ahh, its frustrating than ever. Finally when the train arrived at 01:30 I din find my coach S10. So I walked till one end of the train until unreserved and returned back to the other end to find "10" written in 3:1 ratio giving a look of S1. Finally boarded the coach and slept. No TTR came to disturb my sleep, after all they are also humans. Reached Erode at around 8 in the morning. Went to the lodge to refresh myself before going to the wedding hall. Frustration again to find no water :/ Then finally reached the wedding hall to find everyone taking rest after a nice breakfast. Meet the wedding couple, wished them and clicked few. It was like "In pursuit of Happiness..." that small moment to see - I call it Happiness. Took rest for few minutes, started towards home and reached home at 4pm. BTW, you are part of the (apparently jobless ;)) Green Team ? A CO2 or N2O or whatever meter, I guess will be running on battery. So, it consumes energy and contradicts the mission. Add to it, the batteries will be dumped somewhere causing environmental pollution. Thanks Sankar! Happy that I din get any typo corrections from you this time. Oh ya! I would not accept any for that matter. Also she was weak enough that she cant carry my luggage and walk away! Btw din notice how the billboard was powered with, but guessing that it would be electricity. Since they were more than the size of office white boards. Also it was not a cosmetic graphical plasma screen to drink power. A few RED LED's. Would be negligible when compared to the motive its there. you said.. the old woman was very week. It is "weak" not "week"
I can curse myself 100 times for making such errors! Thanks Dad, its updated now.